Notes: Very rare postmark - Cheltenham home of GCHQ (Government Communications Headquarters) - Immaculate condition, very fine postmarks - you will not find better than this! 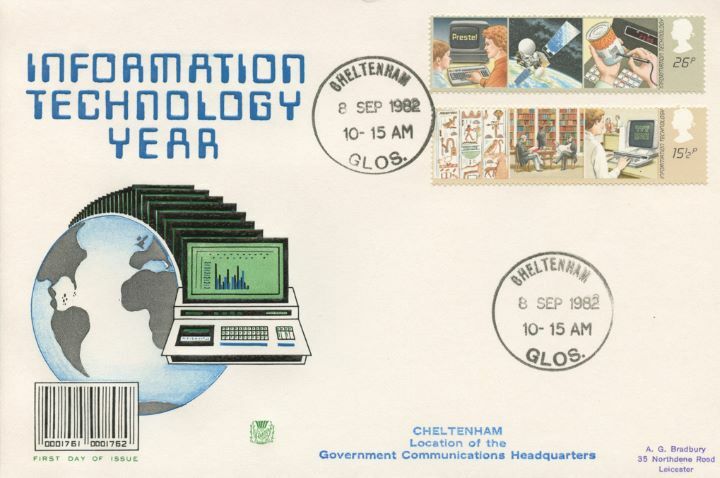 The above Royal Mail Information Technology stamps were issued on 08 September 1982 by Royal Mail and feature the following stamp designs: 15 1/2p History of Communications; 26p Technology Today. The GCHQ first day cover with the Cheltenham CDS Postmark postmark has been produced by Stuart and features these stamps which can make a very collectible and lovely gift.